Founded in 1997, 3dcart is a complete and robust eCommerce platform designed to help online store owners thrive in a competitive market. With hundreds of features built directly into its software, business owners can effectively open, operate and maintain a successful online store with relative ease and efficiency. Today, we are an Inc. 5000 company, a Visa PCI Certified provider and a pioneer in mobile commerce and digital marketing. At 3dcart, we take extreme measures to ensure you’re always delivered the best results possible. We want your business to succeed, and we’re not afraid to go the extra mile to make that happen. We want our entrepreneurial customers to prosper and flourish with 3dcart, which is why we’ve ensured our platform sets the par for reliability, with a 99.9% uptime guarantee and 24/7/365 customer support. 3dcart runs on customer satisfaction. Our daily focus is to provide our merchants with the best support, services, and experience possible. When you’re happy, we’re happy! We understand that your business is vital to your livelihood, which is why our IT and Support team work round-the-clock to ensure you’re website is optimally working at all times. What drives us to excel? Our clients mean everything to us, and our entire team remains committed to doing whatever it takes to help our merchants prosper in eCommerce. Your continued success is what drives us forward, and we will continue to innovate and expand our solution in an effort to help every 3dcart client realize their entrepreneurial dreams. The eCommerce landscape is constantly changing, and five years from now, we see ourselves positioned as the premier eCommerce software solution for entrepreneurs who seek a real advantage over their competition. Because we are vigilant about updating our platform to implement the latest cutting-edge technology and SEO techniques, we will continue to pull ahead of the game and equip our merchants with the most advanced tools in eCommerce. By staying true to our customers, keeping our features fresh, and driving innovation, we're committed to evolve and become the preferred solution for business owners passionate about profits and overall success. A graduate of Florida Atlantic University, Gonzalo incorporated "Infomart 2000" in 1996. In 2001 he singlehandedly conceived and developed 3dcart version 1.0 as an affordable and highly customized shopping cart solution. Today, he is largely responsible for the vision and day-to-day operations of 3dcart. Although, as a programmer at heart, he has never stopped getting his hands dirty with the software code or adding something new to the arcade room. Joining the company in 2004, Jimmy manages business development and technical planning, and oversees the daily operations and overall strategic direction of the company. Jimmy attended UNY in Venezuela where he obtained a B.S. in Industrial Engineering. As an authority on eCommerce best practices, Jimmy coaches businesses of all sizes in the areas of SEO, eCommerce, logistics, digital payments and online marketing. Danilo is tasked with coordinating our overall development procedures including programming, feature implementation, deployments and maintenance. Holding a bachelor’s degree in Computer Science from Mackenzie University in São Paulo Brazil; Danilo joined 3dcart in 2008, and has since become well known for his practical jokes on unsuspecting co-workers. As Director of Professional Services, Samantha manages the daily operations and planning needed to execute custom projects for 3dcart clients and also spearheads our own internal design efforts. When Sam isn’t working hard to build successful ecommerce websites, she keeps herself busy searching for the newest culinary hotspot in South Florida. Walt joined 3dcart in 2011 and has over fifteen years of experience in the web hosting and ecommerce industries. He is responsible for overseeing and managing the support team. When he is not running the support floor he is knee deep into numbers as he loves metrics. Walt is a jokester at heart and the reigning champion of foosball at 3dcart. Michael leads the 3dcart sales team with over 10 years' experience in leveraging SaaS technology to help businesses succeed. He prefers a people-based approach and always seeks to connect growing businesses with the best possible solutions. Michael believes in a healthy work/life integration and spends as much time as possible out on the water. At 3dcart, our goal isn't just to create the best online stores in the world. We also seek to give back to the community in every way we can, every day, through 3dcart Cares. 3dcart Cares contributes through a variety of ways, from donations to volunteering. We love to help worthwhile causes that promote education and entrepreneurship, empower the youth to reach their full potential, provide disaster relief and emergency aid, and much more. 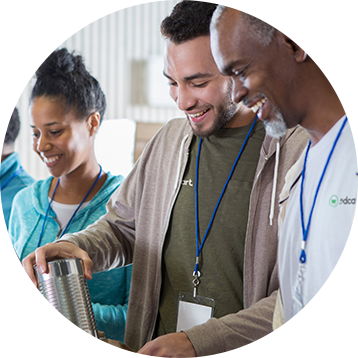 We make a difference in our community by fostering local partnerships between 3dcart and nonprofits and charity organizations. We get involved however we can to help improve the world around us. Check out the details of 3dcart's charity contributions! We have an extra-special relationship with our home of Broward County, Florida. To express our love and appreciation for our home, we support Broward-based nonprofit organizations with free 3dcart accounts to help them market and fund their good works. Want to know more about free websites for Broward County nonprofits? and want to build technology that people love to use. We’re ready to help you with whatever you need!